Directions Apply to towel-dried hair. Shake the aerosol can well and hold it upright. Hair Removal. Hair Styling. Huge Product Range. Max Factor. We have over 10 years of experience in the Health & Beauty category. Containing Expansyl-A, which boosts and lifts your hair giving long-lasting support from the roots. Caution Pressurised container: protect from sunlight and do not expose to temperatures exceeding 50ºC. 150ml Silk & Gloss Fixing Mousse. 6X L'oreal Paris Line Studio. Strong hold mousse. UV filter. Perfect for 60's chignons or even a big-bouncy blow-dry. Apply to shampooed and towel-dried hair. Spread through your hair with a comb or your fingers to give hair a volumised look. L'Oreal Tecni Art Full Volume Extra . 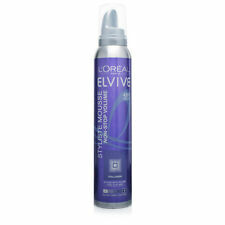 L'Oréal Elvive Styliste Mousse Extra Volume 150ml. Condition is New. Dispatched with Royal Mail 2nd Class Letter. Directions for Use: Apply to shampooed and towel-dried hair. Blow-dry or style with fingers. Need help or advice?. The hold and definition of a mousse with the care of a delicate cream. This volume mousse helps you create big hair with extra volume and a strong hold without weighing hair down. The UV filter protects hair from the sun. Suitable for fine hair. Apply hair to your washed and dried towel. Let us know if our service could be better and what we can do to improve. L'Oréal Studio Pro Curve It Curl Mousse 200ml. Condition is New. Dispatched with Royal Mail 2nd Class. CURVE IT Mousse's Double-Hold formula gives you curl definition for up to 48H*. - Unlimited styling opportunities, for the wave riders and curl creators. - Strong fixation and natural touch - The formula provides the perfect blend to fix your hairstyle while preserving the natural touch of your hair. - With this ultra-fine diffusion system, Studio Pro can be applied on damp hair, to perfect the finish of your style. The lengths and ends are left feeling supple and light. We launched our online trading identity, Hair Heaven, back in 2002 and we were one of the first hair and beauty suppliers to provide online buying facilities. 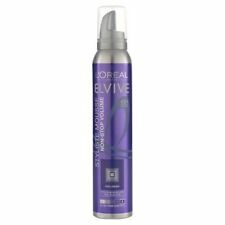 L'Oreal Elvive Styliste Colour Protect Caring Mousse with UV Filter is specifically designed to protect your hair and to keep your hair looking shiny for longer. Your colour looks vibrant and shiny whilst your style holds without any stickiness. Shake well before use. Put a small amount of product in your hands and then apply to wet hair. Style with a brush or fingers. The degree of fixation: 4 - Strong. Trena is a rapidly growing on-line distributor of hair and beauty products. The must-have glamorous red carpet look is the classic waves and curls. Discover Hollywood Waves by Tecni.ART. Our go-to product for curls, Spiral Queen nourishing mousse adds contouring and definition to wavy and curly hair. The mousse preserves the hairstyle. Shake before use. Spread a small amoount of product in your hands, apply on damp hair. Style with your fingers or use a brush. The hold level: 5 -Extra strong. Trena is a rapidly growing on-line distributor of hair and beauty products. 100% Authentic & Genuine Products. Shake well before use. Spray a small amount of the product at the roots of each strand, and then style using a hair dryer or with your fingers. HAIR CARE & STYLING. Hair Colourants. Trena is a rapidly growing on-line distributor of hair and beauty products. This root-lift-light mousse will leave ends light and supple whilst creating volume at the roots. Suitable for all hair types. Give your curls renewed bounce: scrunch the mousse between your hands and listen to it fizz before applying it throughout clean, towel-dried hair. Define curls by winding each section around your finger while blow-drying. Pressurised container: protect from sunlight and do not expose to temperatures exceeding 50ºC. Do not pierce or burn, even after use. Keep away from sources of ignition - No smoking. Keep out of reach of children. How to use: Shake before use. Spray a small amount at the root of every hair strand, then style with dryer or with fingers. HAIR CARE & STYLING. Hair Colourants. Trena is a rapidly growing on-line distributor of hair and beauty products. A unique foam spray that helps you to create expert volume right from the roots, the Tecni Art Volume Lift Mousse (250ml) by L'Oreal Professionnel promises natural-looking volume without weighing down the length of your hair. Leaving you with hair that has natural movement, this spray is designed to be applied to clean, towel-dried hair before styling as usual. Here I have for saleL'Oreal Studio Line Silk & Gloss Curling Mousse 200ml x 2. Well defined curls without any frizz for 24 hours! Spread evenly through hair with a comb or fingers and blow-dry in. loreal techni art full volume mousse. Condition is New. Dispatched with Royal Mail Signed For® 2nd Class. L'Oreal Tecni Art Wild Stylers 60s Babe Rebel Push Up 250ml . For Lifeless Curls. L'Oreal Studio Curl Power Re-Curling Mousse. No stiffness. The hold and definition of a mousse with the care of a delicate cream. Long-lasting hold and body. Soft feel, lightweight and non-greasy. For use with hairdryers. Silky, long lasting result.